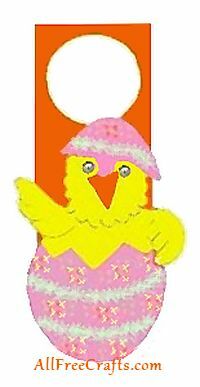 Use our free printable pattern to make this cheery Easter chick door hanger for your room from paper, felt or craft foam. 1. Print and cut out the pattern pieces. 2. Trace the egg pattern on yellow paper, felt or fun foam, then trace the other pattern pieces on colors of your choice. Cut out each piece. 3. Assemble the chick on top of the door knob hanger. Start with the egg and place it at the bottom of the hanger. Going up, glue on your pieces. You’ll put the chick on next, with the hat on top of the chick and the nose in the center of the chick. Glue on a pair of movable plastic eyes, then use a magic marker to trace on lines for feathers. 4. Glue on sequins, ribbons, confetti, or other decorations, and you are done! 5. 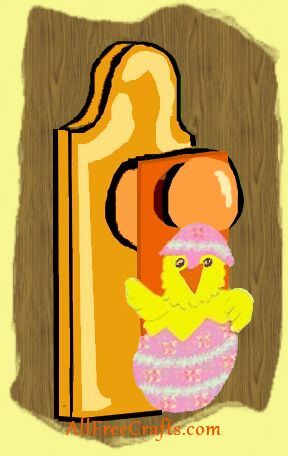 Hang your Easter Door Hanger on the door knob, and enjoy!